POG is a non-profit organization that was established in 1998 for the purpose of keeping alive the legendary Penton motorcycle. This family oriented club would not be possible without the generous support of its members, fund raising and other contributions. Membership in the Penton Owners Group entitles you to receive a one years subscription to the quarterly newsletter entitled “Still Keeping Track”. This title is based on the original publication some 30 years ago for the Penton enthusiast entitled “Keeping Track”. 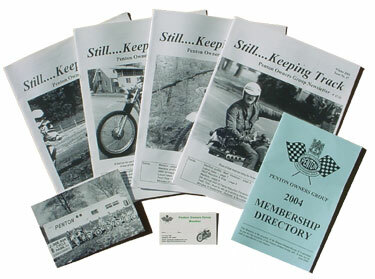 Still Keeping Track is packed with technical information, invaluable restoration how-to’s, fascinating member profiles, fun motorcycling stories, informative Penton historical data and much more. You will also receive a membership card bearing the image of an early Penton motorcycle, a Penton Owners Group member sticker to show your loyalty, a member profile form to be filled out about yourself, and while supplies last, the most recent membership directory. You will also be able to take advantage of limited-edition club merchandise. The Penton Owners Group is not just a club of people that have an interest in the Penton brand. Many of its members are veteran ISDT Gold Medalists or were employed by John Penton at Penton Imports as this motorcycle began to be recognized. Even John Penton himself is a very active member of this organization. If you would like to meet any of these people, join the Penton team and attend any of the club functions as seen on the Events page of this website. For a small membership fee of $20.00 per year, you too can help keep alive this organization and one man’s dream for generations to come—the classic Penton motorcycle.